The Innate Immune Response to Non-infectious Stressors: Human and Animal Models highlights fundamental mechanisms of stress response and important findings on how the immune system is affected, and in turn affects such a response. In addition, this book covers the crucial link between stress response and energy metabolism, prompts a re-appraisal of some crucial issues, and helps to define research priorities in this fascinating, somehow elusive field of investigation. 1. An overview of the innate immune response to infectious and non-infectious stressors. 2. Homeostatic inflammation as environmental adaptation strategy. 3. The molecular basis of the immune response to stressed cells and tissues. 4. Modulation of innate immunity by hypoxia. 5. Metabolic stress, heat shock proteins and innate immune response. 6. Innate immune response and cancer metastasis. 7. Innate immune response and psychotic disorders. 8. Modulation of the interferon response by environmental, non-infectious stressors. 9. Disease-predicting and prognostic potential of innate immune responses to non-infectious stressors: human and animal models. Professor Massimo Amadori is a Senior Scientist at the Istituto Zooprofilattico Sperimentale della Lombardia e dell’Emilia-Romagna (IZSLER), via A. Bianchi 9, 25124 Brescia, Italy. Professor Amadori has developed tests of innate immunity in cattle for investigating animal health and welfare, and started and managed the Italian site of the European FMD vaccine Bank. He has been the official responsible for the Italian National Reference Centre for Animal Welfare, and has written 68 articles and chapters in the Journal of Interferon and Cytokine research, amongst others. He has an H index of 62. 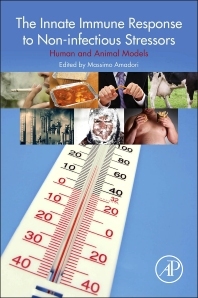 Previous books published with the editor’s contribution: 1) "Acute Phase Proteins as Early Non-Specific Biomarkers of Human and Veterinary Diseases," InTech, Open Access Publisher. 2) “Diagnostic Bacteriology Protocols, 2nd Edition," Humana Press (Methods in Molecular Biology 345). 3) “New Research on Innate Immunity,” Nova Science Publishers.